You better believe that everyone on the liberal circuit wants to embarrass and eviscerate all those that rival their ideologies because they can’t handle opposing views or counterpoints. That’s a fact. That’s when they act like children – throwing temper tantrums on social media, typing their fury in all caps because they want the world to know how desperate they are. 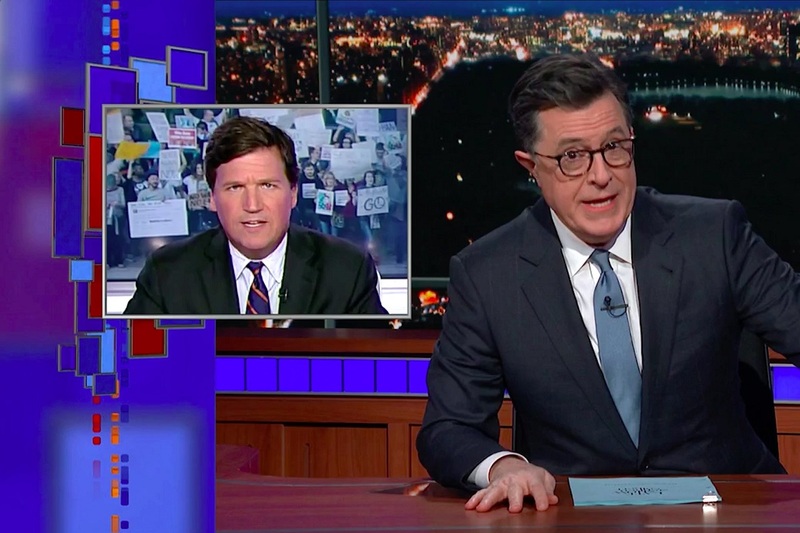 And this was a tactic that has been used on Tucker Carlson lately and what Stephen Colbert said about him will make you furious. Make no mistake; Stephen Colbert is the leader of the liberal pitchfork mob. You can actually tell that because of the show’s ratings in the President Trump era. Before Trump was elected and Colbert took over for David Letterman on CBS’ The Late Show, of the three big shows in the 11:30 ET time slot, Colbert was a distant third. But then Trump was elected and all of the material was about trashing conservatism every single night so liberals flocked to the show. They made it number one in late night and still holds that title today. What you should know is that all of these hosts that spew anti-Trump rhetoric absolutely despise Fox News and all of their anchors, which includes Tucker Carlson who made the news this week over comments about immigrants flooding over the southern border at an alarming rate. Tucker Carlson is losing advertisers right and left now because of the immense liberal backlash over his comments. Many celebrities advocated for companies to pull their advertisements off of his show like super-producer Judd Apatow who rallied for it so hard that it nearly forced them to comply or face the pitchfork mob. So far, two dozen companies, including Sandisk, Harris Teeter, Lexus, IHOP, Just for Men, Pacific Life, Jaguar Land Rover,and many others all pulled their ads from any time primetime slots associated with Carlson’s show. His show has declined from 36 regular ads per broadcast before his comments, to 20 regular ads – not including in-house promos for Fox content – after his comments. This boycott mentality because liberals can’t handle the reality of the situation needs to stop. Most of the illegal immigrants forcing their way into our country don’t have a dime to their name. That’s why they came here in the first place. What Carlson said certainly didn’t have tact or empathy but he’s not wrong with his comments. Liberals need to get a clue and stop throwing tantrums over everything that they disagree with.